There are several questions which regularly follow the conversational revelation that I am a ghost writer. ‘Why on earth do you want to do that?’ is usually the first puzzled response. ‘Don’t you resent someone else getting all the glory?’ is the next, and ‘So what famous people have you done?’ nearly always gets an outing before the listener’s curiosity on the subject is finally sated and one can move on to asking them about their lives, (a much more comfortable conversational position for any writer). The fundamental problem facing any professional writer is finding a steady supply of ideas and subjects so dazzlingly certain to appeal to the book-buying public that publishers are bound to put up huge advances. One answer is to collaborate with other people who lack writing skills and experience but have all the necessary information. These people might be celebrities who would impress publishers because of their notoriety through the tabloid or other media, or ordinary people who have undergone extraordinary experiences. Alternatively they might be experts in subjects that the public want to know more about. The idea was first put to me by a management guru I was interviewing for a business magazine. He’d been asked by a publisher to write a series of management books. He wanted to have the books out in the shops because they would be good public relations for him, but he didn’t have time to write them. He suggested that I should write them for him, having attended a few of his seminars and riffled through his filing cabinet. In the film industry, as screenwriter William Goldman and others have repeatedly pointed out, everything about the writing process has to do with teamwork and collaboration. Why should the same principles not apply to book writing? The idea started to grow on me. By using someone else’s knowledge I can cut my research time for a book from months to days because I’m going straight to the source of the material rather than having to ferret around in cuttings libraries and drink endless cups of tea in the front rooms of the subject’s childhood friends and relatives. The subject of the book can cut their time on the project from months of agony in front of the computer screen to a few hours spent editing a typescript produced for them by the ghost, (and sometimes they don’t even bother to look at it before it goes to the printers). If collaboration and adaptation were good enough for William Shakespeare, they should be good enough for the rest of us. As to not getting the “glory” of being the sole author, anyone who is not a celebrity and has had a book published will know how fleeting the glory is. Only the smallest percentage of books get reviewed. Most vanish completely from the shelves within a few months of publication, and are usually pretty hard to find even during those few months. Apart from a handful of literary stars, (many of whom choose to write under pseudonyms anyway), few people recognise the names of authors. But when I wrote an autobiography of Eastenders star, Gillian Taylforth, who at the time was dominating every tabloid front page that Princes Diana wasn’t, the book was written about in virtually every newspaper in the country and talked about on virtually every chat show that the publisher’s publicity team could persuade the poor woman to go on. While Gillian was spending a week being whistled around all day from breakfast television to late night television, I could stay comfortably at home and get on with my next project, content in the knowledge that the promotional side of the project was in the hands of a true mistress of the media. Nothing I could have said to any of those journalists or chat show hosts would ever have made the story such an attractive prospect as Gillian’s media appearances did. Sometimes the ghost’s name will get mentioned on the cover of a book and sometimes it will appear only on the flyleaf. Sometimes you will get a mention in the acknowledgements and sometimes you will not appear at all. It does help if your name can appear somewhere on the cover of the books you are most proud to be associated with. You may get billed as “co-author”, but it is more likely to say “By Big Shot with Joe Bloggs” or “as told to Joe Bloggs”, but it is never a problem if it disappears. Of all the advantages that ghosting offers, the greatest must be the opportunities that a ghost gets to meet people of interest. It’s a licence to ask the sort of questions that you truly want to know the answers to, and to be allowed inside some of the most extraordinary stories. Ghosting a book for someone is like being paid to be educated by the best teachers in the world. Imagine, for instance, being asked to ghost The Origin of the Species for Darwin, or The Decline and Fall of the Roman Empire for Gibbon. Imagine being paid to learn everything that is in the heads of these people and then turning their thoughts, words and notes into book form. Could there be a better form of education? 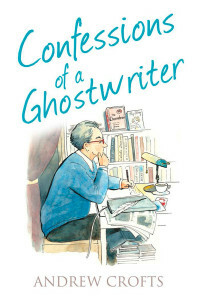 Of course, not all people who use ghost writers are going to create books of such lasting value. But suppose one of your specialist areas is information technology. If you get invited to ghost for one of the most famous innovators in the business you will be able to ask questions about the future and learn things at his or her knee which other people would have to pay good money for in the form of consultancy or seminar fees. After I’d written the books for the management training guru I started advertising. Zana Muhsen, who had escaped back to England after her father had sold her as a child bride in the Yemen, went to her local library to find out about ghost writers. The librarian obligingly looked me up in The Bookseller. Having been to see her and heard her story I wrote a synopsis and sample chapter of Sold and found an agent to represent it. The book eventually translated into every possible language and has so far sold over three million copies and spawned a sequel. In 1992 it was France’s best-selling non-fiction title. To get her story on tape Zana and I spent three days together in a hotel suite in Birmingham and I then spent between two and three months writing. As with all the authors I ghost for, Zana had complete control over the text, nothing would even be shown to the agent until she had okayed it, but she changed almost nothing. Always having one good agent representing both parties in the arrangement, whose prime interest is in getting the book well published, not in encouraging the ghost and the author to fight one another for larger shares of the resulting royalties, means that I have almost never exchanged a cross word with any of my subjects. Being a ghost is a matter of suppressing your own ego completely, which is a good discipline for any writer. I’m fulfilling a similar function to a barrister in court, pleading the case of their client. I listen to their story and then tell it for them, helping to get across their view of the world and the way things happen in it. One of my ghosted works was for a woman who’d come from a humble background and had managed to make her way right to the top of society by being the mistress of a series of rich and influential men. She then exploited her position by selling her story to the media. She needed a ghost who would not challenge her about the morality of what she had done, but would simply listen to what she had to say and understand how she justified her position to herself. Had she been able to write the book herself that is what she would have wanted to say. If the writer wishes to be critical of the subject then they must step back and create an objective biography, not an autobiography. It’s important that a ghost is interested in the subject. If they have nothing to say that you want to hear the project will become unbearable. Imagine spending that much time talking to someone who bores you, and then having to go away and write it out all over again. I always judge a project by whether I think it interests me at more than one level. Had Gillian Taylforth merely been a soap actress telling anecdotes about other Eastenders actors I doubt if I could have created a whole book for her. But she was also a woman who the tabloids couldn’t leave alone, who had a boyfriend they seemed to love to hate, which gave her another dimension. On top of that she had had the courage to take on the might of the News International organisation in court and, even more amazingly, she had lost the case and faced personal financial ruin and ridicule everywhere she went. Despite all this she remained a resolutely charming and funny woman with a strong family all around her. It had the makings of a Greek tragedy and worked at so many different levels it was easy to find enough material. The same applied to Sold by Zana Muhsen. Not only did it give an insight into the alien culture of a peasant girl in the Yemen, there was the adventure element of whether she and her sister would be able to escape and the insights which she could give into the way the diplomatic world allowed them to become victims of political expediency. It was one of the first books to talk about life behind the veil from the point of view of someone who had experienced it and it was all told in the voice of a straight talking Birmingham girl. It was like a true version of an Arabian Knights tale and a nightmare that any young girl can understand. In My Gorilla Journey, which I worked on with Helen Attwater, there was the story of a young woman heading off into Conrad’s “Heart of Darkness” in the Congo. On top of that there was the emotional story of how she fell in love with the young gorillas against a background of her relationship with her husband, who was working with her, the civil war which was brewing up and the terrible tropical diseases which practically killed them both. It provided the escapism of a great travel story mixed with a personal odyssey and an insight into the fascinating world of gorillas. In Through Gypsy Eyes, which I ghosted for Kathy Etchingham, there was the superficial story of her relationship with Jimi Hendrix, but behind that was a story of a young girl who ran away from home at fifteen and ended up at the heart of the music industry in London during the Swinging Sixties. It also looked at the way in which a cult figure like Hendrix attracts the dangerously unbalanced and the way in which that impacted on Kathy years after Hendrix’s death, when she had changed her life completely and become a doctor’s wife in Surrey, bringing up two sons. Again it was a Greek tragedy filled with great heroes being brought down and gave an insight into where the giant rock music industry of today started. It is essential for the ghost to make the subject feel completely comfortable and confident in his or her company. If they think the ghost is going to criticise them, judge them or argue with them they will not relax, open up or talk honestly. It is not the ghost’s job to try to make them change their opinions about anything or anyone, but rather to encourage them to tell their story in the most interesting and coherent way possible. The ghost must be able to coax them off their hobby horses and persuade them to answer all the questions which the eventual readers are likely to ask. Once the voice is on tape the ghost then has to create what amounts to an 80,000 word monologue, just as a playwright might do, staying completely in the author’s character at all times, using the sort of vocabulary the author would use and expressing the same views, ideas and prejudices. When Colonel Mark Cook asked me to ghost his book Promise of Hope, about the re-building of an orphanage in Croatia and the effects the experience had on his family life, he was worried, having read Sold, that he would come out sounding like Zana. I assured him that my goal was to make him sound like a public school educated Ghurkha Colonel enjoying a mid-life crisis, not a fourteen year old Birmingham girl who has been white slaved for eight years in the bandit-ridden mountains of North Yemen. If a ghost fails to catch the voice of an author the project is doomed. A ghost must also be able to see the structure of a book from early on in the process and then be able to package the concept so that an agent can sell it. He or she then needs to be able to guide the subject into providing the right material, keeping them on track and clearing up any inconsistencies in the telling of the tale. How the ghost gets paid will depend largely on how speculative the project is when they first become involved. If there is no publisher involved and I am going to have to produce a synopsis and possibly a sample chapter on spec, then I would suggest splitting the proceeds 50/50. That way we’ve both wasted our time and energy if the project doesn’t find a buyer and will both be equally motivated to make it a best seller if it does. If the other party is a celebrity and it is obvious the book will make a large amount of money from serial rights or foreign sales, the ghost might have to accept a lower percentage, or a percentage that will become lower once he or she has received a pre-agreed amount; e.g. the proceeds might be split 50/50 until the ghost has received £50,000, at which stage his or her share might then drop of 40%, and might then drop again at £100,000. If the project already has a publisher and the ghost is actually being asked to write the book with no speculative work involved, then it may be that a fee will be suggested. One of the reasons publishers like to use ghost writers is because they know they will be able to rely on them as professionals. They just want to know that the book will arrive on time in a publishable form, conforming as nearly as possible to the synopsis or the brief. Frequently the authors of the books are busy people and hard to get hold of. Sometimes they are temperamental in some way. The publishers consequently rely on the ghosts to act as go-betweens and to make the process of publication as smooth as possible. The ghost is also the subject’s best friend in the publishing business. During the long months when the agent is trying to sell the project and the phone doesn’t ring, he will assure them that this is perfectly normal and doesn’t mean they will never find a publisher. When they see the first draft of the manuscript and panic at all the indiscretions when they see them in black and white, he will be the one to calm them down and assure them they can remove anything they want to before showing it to anyone else, (once given the power to make changes they nearly always decide they can’t actually think of a better way of putting things and leave it virtually untouched). When the publisher wants to change the title or favours a cover in the subject’s least favourite colour, the ghost will again have to be there to assure them that it will all be okay on the night. Then when the book comes out and the subject can’t find it on the front table in any of their local book shops, the ghost will have to explain the economics of the business to them and try to dissuade them from ringing the publisher and ranting and raving. In other words, it’s an endlessly varied, interesting and rewarding job. He knows the business very well, and it is a business he now explains clearly and in detail. I would like to thank Andrew Crofts for permission to use the quotes from his excellent handbook “Ghostwriting”.